I found out that I got into this race via lottery in early July and decided to take the plunge. I wanted at least one fall half (and was still planning on running the Richmond Half). 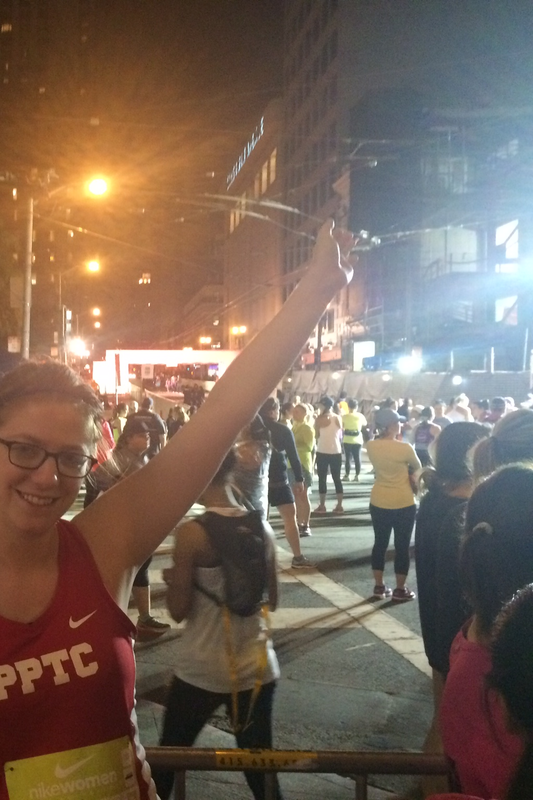 This was my first destination race and my first that wasn’t NYRR or NYC Runs. I asked around and everyone who had run the race before said it was an amazing course and that they had a great time. I felt overdue for a trip to the Bay Area, so I decided to make it a full 4-day trip, from Friday morning to the last red-eye out Monday night. 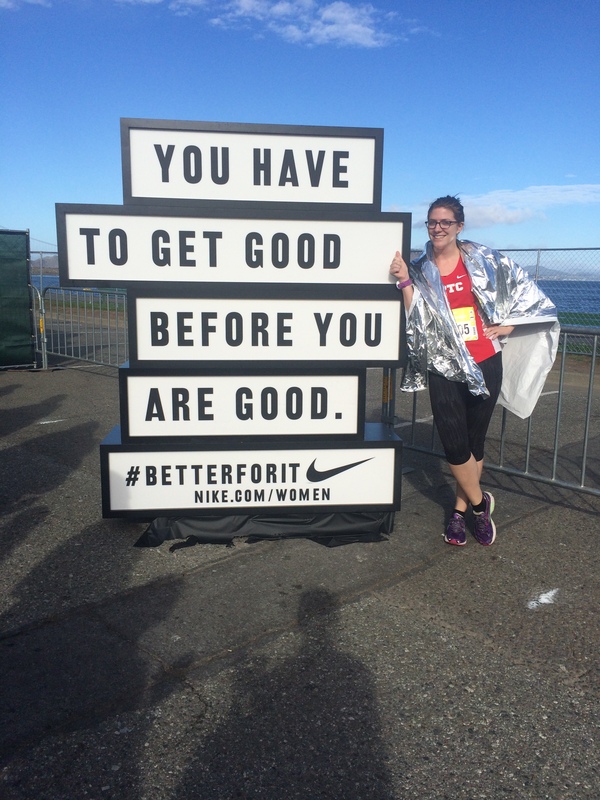 I’ll make this post focus on the race and other activities (and swag), then make a separate “what I ate” post because y’all know I went HAM out there before and after the race. The pre-race activities were fun and helped instill a bit of the ‘community’ feel for such a big race. I enjoyed the Friday Get Focused workout and bonded with my Airbnb housemates who were also running. I ended up skipping the Saturday morning shakeout run because I had walked over 5 miles Friday and close to that on Saturday. 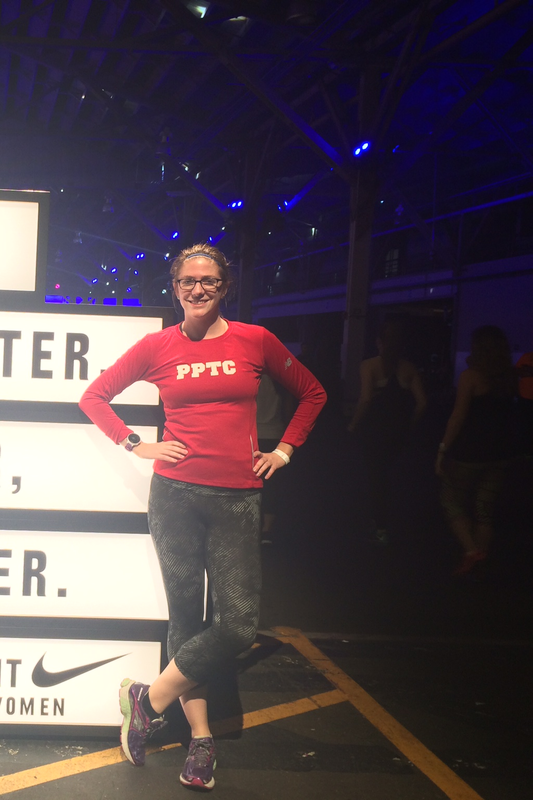 Posing after packet pick-up during the swag purchasing point #1 at Niketown. I needed a Dri-fit hat anyway. 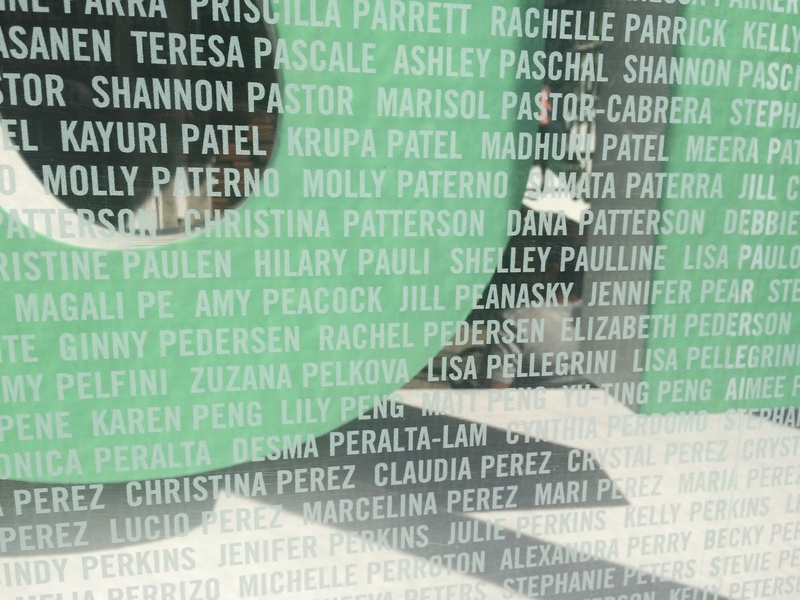 I found my name on the Niketown store window pretty quickly as well as a friend’s who I didn’t know was running the race. Stretching to Hotline Bling with my housemates during the Get Focused workout. My goal for this half was just to finish without Achilles pain, since I knew a PR was out of the question and my eventual goal for sub-2 will have to wait a little longer. I ended up going even slower than I planned on and after the first few miles and hills, decided to not have qualms about stopping for pictures or walking through water and snack stops. I don’t usually race with my phone (just my Garmin Forerunner 220), but used both so I could enjoy some tunes and snap some shots. I ran my running club’s singlet with Lululemon Top Speed Crops because they have a zippered pocket as well as smaller waistband pockets. I wanted to bring shot-blocks with caffeine and keep the free gel along the course in there in case I didn’t need it. I was at the front of Wave 2 because my housemate was going for a 9:10 pace, but I wisely decided to step to the side and drink more Nuun (cup #2 of 3 pictured below), so I ended up more in the middle of the pack. The first wave took off right at 6:30, and I crossed the start line around 6:41am. The first few miles had some uphills and I was trying to reconcile the course map in my head with the neighborhoods I had already visited Friday and Saturday. This was a pleasant distraction for the first 5K or so. 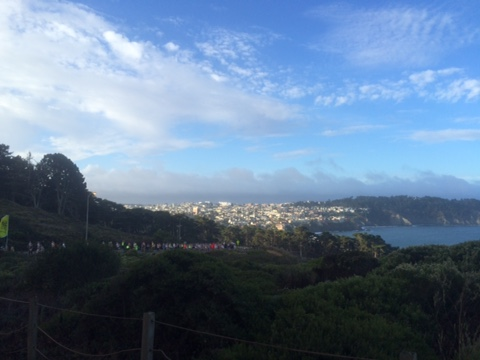 We entered Golden Gate Park, which was my favorite part of the run. I had hung out there before when visiting and loved the waterfalls and bison, so I actually did take some quick shots this time. There was some crowd support and bands, along with ample enough water/Nuun stops. I grabbed a small peanut butter bar close to the 10K mark but didn’t eat it because I was a smidge thirsty. As seen below, I was clearly grooving to my tunes. I felt pretty strong exiting the park and took a Vanilla Gu I had grabbed, but definitely slowed on the first of the 2 hills out. 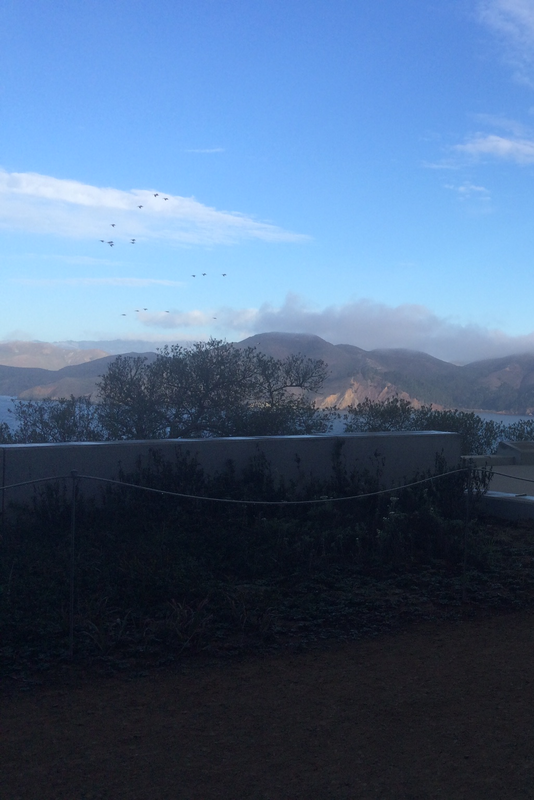 The crowds were picking up a bit as we headed to the Presidio. I remember passing the 10K mark back in the park, but not the 15K mark. There were lots of twists and turns through the neighborhood; if I had been really racing this, I would have tried to run the tangents better. I tried to focus more on making it past THE hill and enjoying the downhills, along with admiring the scenery. 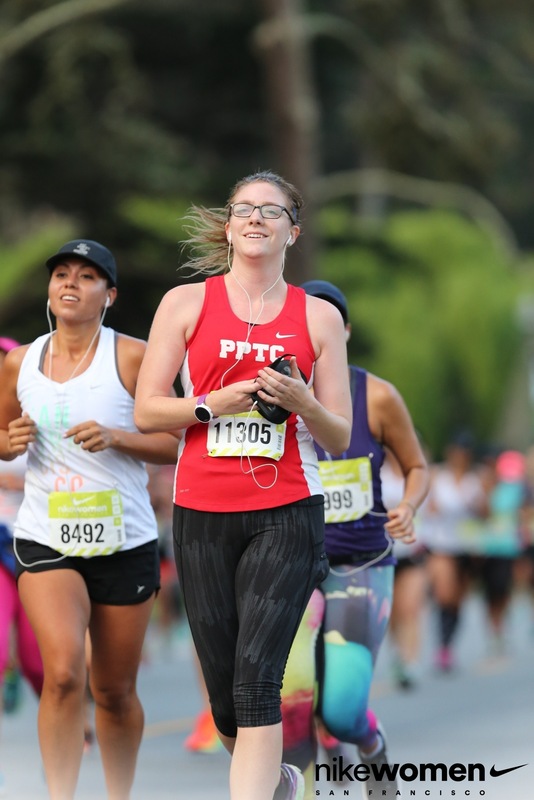 I’m not good at running selfies and didn’t want to mess up a high-five or pass my sweat to a stranger, so I kept my arms to myself but grabbed a few shots at good pause points. After the hill, I knew there were only 2 miles to go and that they would be a mix of downhill and flat. What joy! I felt strong during these, took my final 2 shot blocks, and shoved the chocolate truffle into my zippered pocket for later. I definitely wasn’t flying by the water by any means, but I had a pretty good pace going here. There were a few music groups out, including taiko drums and a Chinese dragon dance. 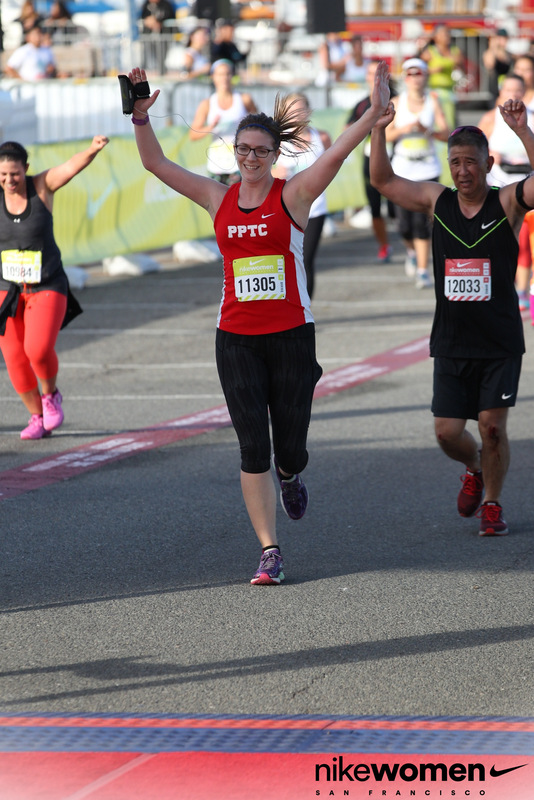 The finish was around a corner and snuck up on me a bit because my watch was over 0.2 miles ahead. I went for the flat-out sprint for the finish but moved myself into the middle so I could have a good finish photo (not usually my strong suit). Nailed it (but please do not look at the knees of the poor guy behind me). I finished in 2:25:34, which is over a minute per mile slower than my previous two halfs (NYC and Brooklyn, both this year). But I guess I did stop for a picture of the bison paddock in Golden Gate Park. And I did shuffle slowly up those hills. So, my sub-2 hour half might have to wait until 2016. The exit went really smoothly in part because they handed us large reusable grocery bags from Whole Foods (with lots of goodies inside), so I could throw everything else into there. Tiffany’s necklace in a box? Throw it in the bag. Hot pink water bottle full of cold water? Drank a lot of it, then threw it in the bag. There was no wait for the Portapotties, so I headed there first. I then got into what would be closer to a 1-hour line for Finisher gear, not knowing everything would be available back at Niketown or on the website. Fortunately, I befriended a couple of other ladies in line and they got the following picture of me. 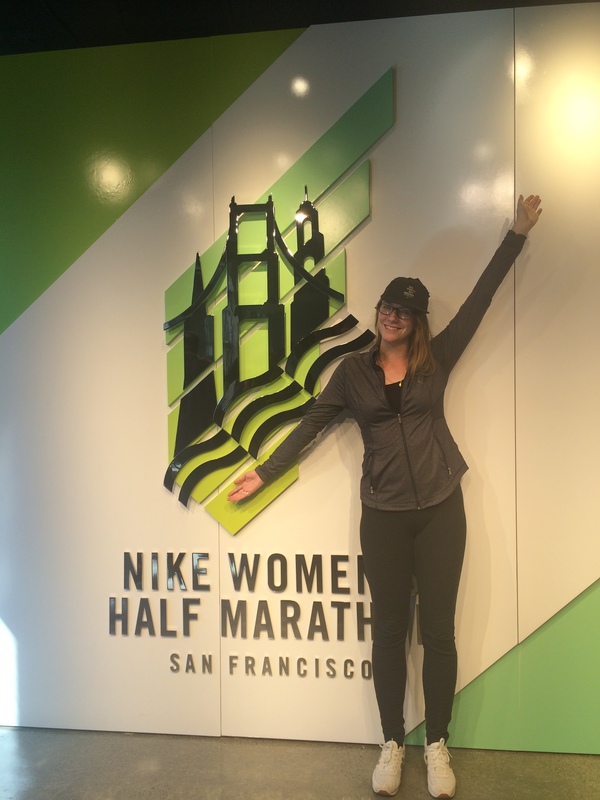 I did not want to wait in line for the official finish photos in front of the light teal backdrop. These motivational words would just have to do. Then there was a long, slow, painful walk to the shuttles. I snacked on my banana, chocolate milk, and peanut butter bar before the bus, then was able to shower and nap and move on with my 3 post-race meals. 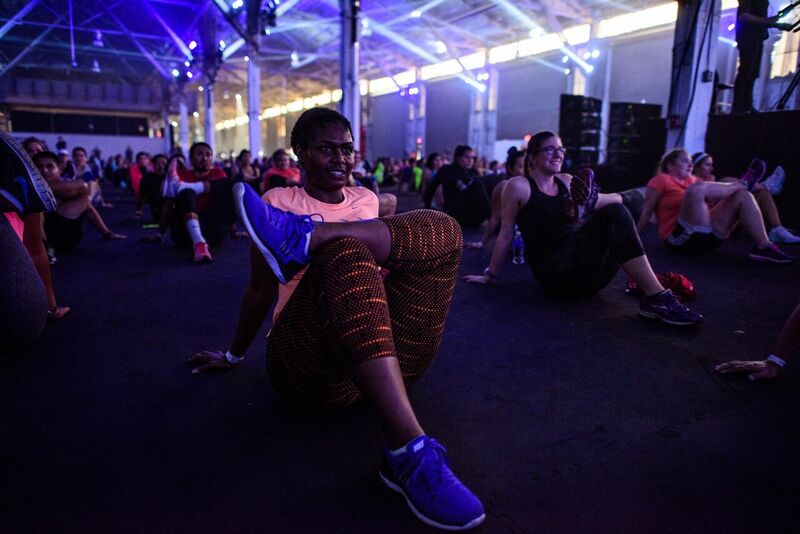 I would try another Nike Women’s event for sure, especially if running with friends. In fact, I might enter for their Toronto 15K next June. 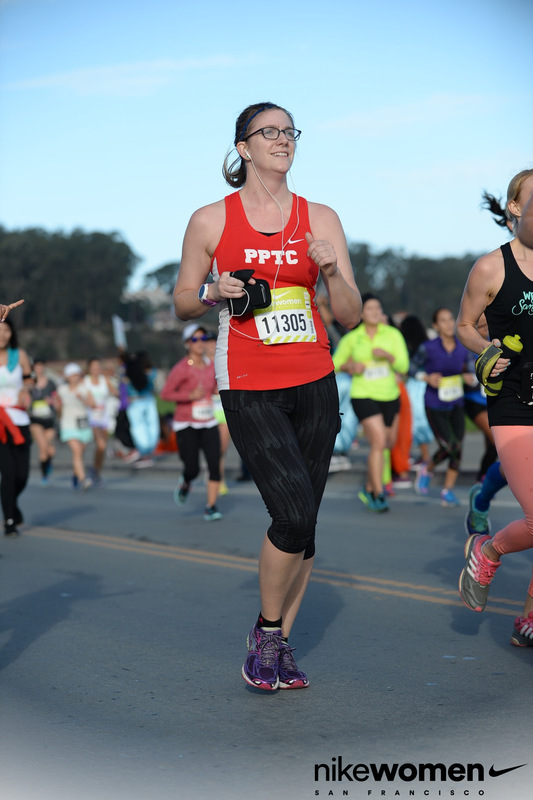 I’m planning to run the NYC full marathon next November, so I probably won’t be able to race SF next year at that point in my marathon training, but we’ll see. After last week’s tumbleweed gif, I’m tempted to post one of EVEN MORE tumbleweeds representing my nonexistent miles, but will refrain because then I’m just pushing this metaphor too far. Monday: Running club meeting, where we focused on upcoming marathons. I had 2 slices of pizza but made the mistake of watching MNF after and drinking. Tuesday: 1 mile warmup and cool down for my 3-mile tempo run after work on the West Side Highway, with plenty of foam rolling before and after at the gym. I grabbed a peanut butter protein smoothie from Gregory’s Coffee then headed to a book launch party and reading for Slaughterhouse 90210 at my beloved .Housing Works Bookstore Cafe. There were free drinks but I wisely did not partake. Wednesday: After a very intense and lengthy dentist appointed, I tried a Boxing Burnout class at Overthrow. Their description on ClassPass: “Overthrow New York is to boxing what soul cycle is to cycling, creating a training experience and filling a need for a functional, efficient, and group oriented boxing workout in the fitness world!” Needless to say, there were no candles or encouragements to ride as a team. I got there early but they were out of wraps, so the front desk guy advised me not to punch too hard. OK, can do. We learned the basic punches and had a cardio warmup in fighting stance, then got to hit the bags (3 to a bag). I’m left-handed but it just made more sense to do everything right-handed with lots of left crosses. We did this in HIIT circuits, which was pretty cool because I knew that by the 5th set, I could really wail on the bag. We then formed two lines facing each other and did a mix of planks, push-ups, mountain climbers, and crunches. It was pretty brutal on the knees and the floor was both wet (from sweat and/or spilled water?) and managed to chip off in small pieces onto my back when laying down. I would definitely try this class again but wear a t-shirt to encounter fewer floor mysteries. I was so glad that I filled my water bottle up in the sink before class because it was pretty warm and musty and everyone without water looked like they were dying. Also, there were about 20 people in the class and 19 were female. I could tell some were regulars, but the instructor was pretty good at helping us newbies acclimate. I stupidly stopped by Juice Press after and should have gotten a smoothie with more protein, but instead grabbed a $10 bottle of Fountain of Youth. I really need to re-join people for Saturday morning long runs so I can #willrunforjuice. Thursday: Normal gym time, with a rowing warmup (2000 meters), then lots of back, chest and arms strength. Grabbed Korean fried chicken and beer after at WA Bar & Kitchen with my lifting partner. Their wings are on the saucy side, so I might just stick with BonChon which has more combo options. Friday: My favorite 6:30am ride with Nikole at BYKlyn. Easy on the knees and Achilles with the added bonus of hills and a great soundtrack. I was exhausted after and might have taken a little nap before work and after my much-needed shower. Saturday: I walked around Prospect Park and the Greenmarket, which were both overflowing with participants of the Brooklyn Rock and Roll Half Marathon. 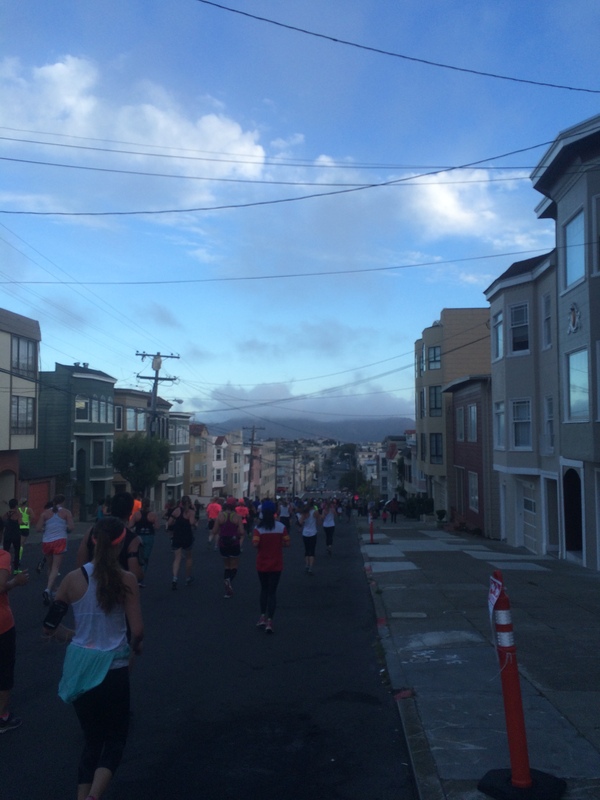 I met up with some friends who had run it for brunch and felt both inspired and terrified for my upcoming San Francisco Nike Women’s half. Sunday: Staten Island 5K. I wanted to PR and go for sub:26 (a logical next step, my current PR is 26:16 from NYCRuns Memorial Day 5K), but I went out too fast (like 20 seconds per mile too fast on the first 2 miles) then crashed on the third during a slight incline for a bridge. 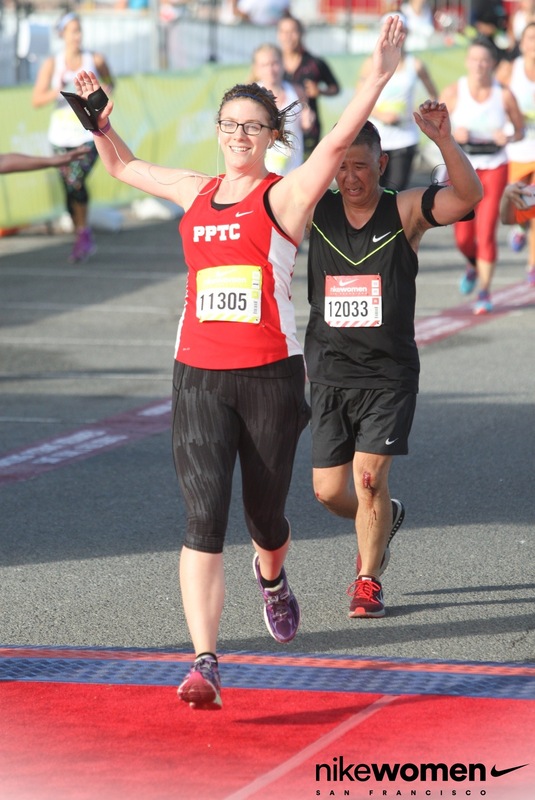 The finish was spectacular, but I knew I had missed my PR. I ended up getting an extra 4 miles in while waiting for the Staten Island Half finishers to come in, then was rendered pretty much immobile because I had stupidly raced in my Brooks Pure Cadence instead of my Brooks Ravennas. I really feel the difference after more than 4 miles, mainly due to the heel-toe drop difference. Race report to come later this week before I leave for SF. I registered for the Bronx 10 Mile back in June along with the Mile, knowing it would sell out. I then entered the late-June lottery for Nike SF and got in early July. The timing is great other than a busy wedding weekend in between the two, leaving me wondering when to squeeze in another 10+ mile long run. But I’ll cross that bridge when I come to it, either before I depart DC, the day before the wedding, or after I come back. 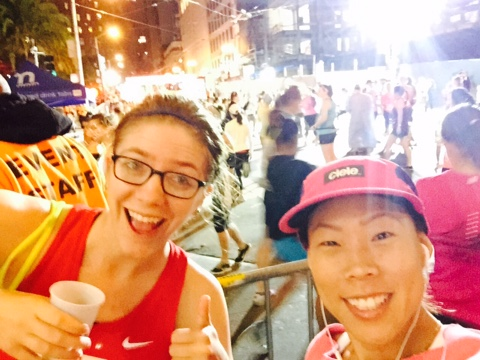 NYC Runs Haunted Island Halloween 10K. I ran the 5K version last year and while I got a 5K PR earlier this year on a similar Roosevelt Island course, I am overdue for a 10K PR. I hated life and the humidity during both the UAE Healthy Kidney 10K and the Queens 10K and walked through the water stops. I think late October weather might be perfect to best myself on either of those runs. I’ll be cheering on many of my friends in the NYC Marathon the day after, so hopefully a race the day before will get rid of my marathon FOMO. Plus I’ll be going out for Halloween that night before waking up Sunday to cheer on my marathon running friends. 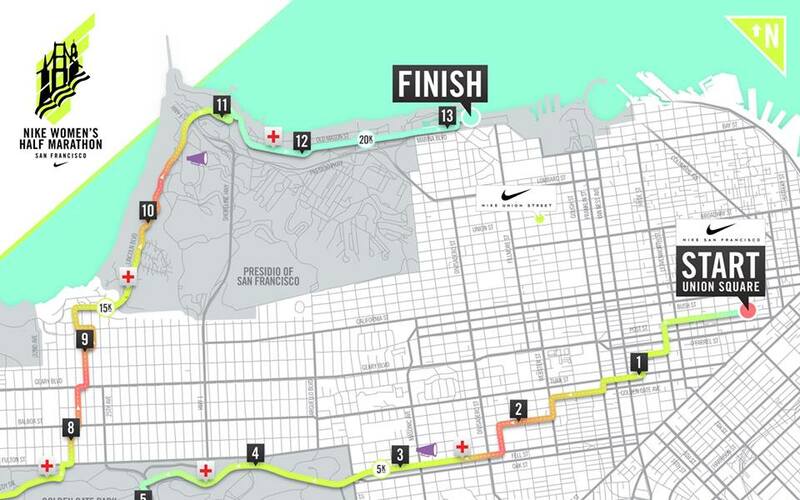 I live right along the course then will probably take the subway to the finish. The Staten Island 5K on 10/11 OR the Race to Deliver 4M on 11/22. Either one will be my 9th NYRR race this year and thus my final race in the 9+1 series. I could of course do both and hope to improve on my NYRR best mile pace. I’m also considering the Jingle Bell Jog for this reason because it’s near me in Brooklyn. I did my volunteer time back in April at the Japan Run and had a great time but am also glad to have it out of the way now that everyone is trying to squeeze in their races and volunteer credit. Richmond Half Marathon on 11/14. Why yes, I would love a hometown race with the option of getting both Dixie Donuts and Sugar Shack Donuts after. This would be the Half I want to PR on this year. There are hills, but I’m pretty sure they’re more gentle than those in San Francisco. A friend who ran it last year told me there’s great crowd support, plus my family is pretty much obligated to attend and cheer me on. It would have been even more reasonably priced earlier in the summer, but I’m glad I’ve waited to register so I can watch for injuries. So, after a fairly slow summer, it looks like fall will be pretty busy. Let’s hope I stay injury-free and that the weather cooperates.